Scientists have long known the ins and outs of equilibrium thermodynamics. Systems in equilibrium — a stable state of unchanging balance — are governed by a neat set of rules, making them predictable and easy to explore. Now an international team with members from opposite sides of the world has discovered evidence that a neat framework for non-equilibrium systems just might exist. Led by Luijten and Steve Granick of Korea’s Institute for Basic Science (IBS), the team found a non-equilibrium system that quantitatively behaves like an equilibrium system. The finding could lead to a set of rules that makes it possible to predict the properties of non-equilibrium systems, which experience constant changes in energy and are required for all forms of life. Supported by the IBS, US Department of Energy, and the National Science Foundation, the research was published online in the Proceedings of the National Academy of Sciences. Luijten and Granick are the paper’s co-corresponding authors. Ming Han, a PhD student in Luijten’s laboratory, and Jing Yan, a former graduate student at the University of Illinois, served as co-first authors of the paper. The research was spurred when Granick and Yan noticed something strange in the laboratory. 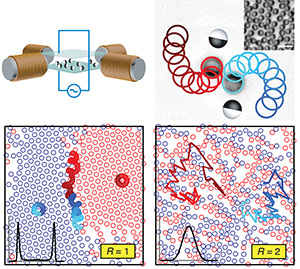 As they watched a random mixture of soft-matter particles called Janus colloids, which Granick previously developed, they observed that the particles sometimes sorted themselves by type. Named after the Roman god with two faces, the micron-sized spheres have one hemisphere coated with a thin metal layer. They self-propel in the presence of an electric field, and when a rotating magnetic field is applied, they move in circles. In the presence of these fields, about 50 percent of the colloids orient their metal-coated hemisphere in the same direction. The remaining 50 percent face in the opposite direction. Granick and his team recognized this behavior as phase separation, which is characteristic of substances in equilibrium. When phase separation occurs, a mixture of two or more liquids separates into layers. Most have witnessed phase separation when shaking an oil vinaigrette salad dressing. After the dressing settles, the layer of oil settles on top of the layer of vinegar. Long-time collaborators, Granick and Luijten pondered the mystery together. Luijten’s team repeated the experiment in computational simulations and found that only when the particles rotated with small radii did they phase separate. They pinpointed that the length of the radius was key. The laws of thermodynamics define relationships between temperature and energy for all equilibrium systems. By knowing the system’s temperature, scientists can make predictions about its other properties. Luijten, Granick, and their teams found that in their non-equilibrium system the radius functioned similarly to temperature as a control parameter.